Seaweed was first consumed in Japan at least 1500 years ago, according to early written records. During the Asuka Era (600-700 AD) and Nara Era (700-800 AD) seaweed was only consumed by the Japanese aristocracy. Until the Middle Ages there was only wild seaweed, which limited it as a food source. During the Tokugawa Era (1600-1800 AD), Ieyasu Tokugawa, the Shogun of the time, ordered fishermen in the small town of Shinagawa (now part of the Tokyo metropolitan area) to bring him fresh fish everyday. The fishermen built an offshore fence and started a fish farm. They also found that seaweed preferred growing on this fence. Thus was seaweed cultivation born. Seaweed cultivation takes many forms but there is a kind of evolutionary process through which it develops, the rate of which is market-driven. If demand is low and natural resources adequate, cultivation is unnecessary. As demand increases, natural populations frequently become inadequate and attempts are made to increase production by resource management techniques such as improving harvesting techniques, removing competing species, adding artificial habitats and seeding cleared areas. Such techniques are most highly developed in Japan, China and south-east Asia. Should such management prove to be inadequate, the use of artificial structures to grow seaweeds becomes inevitable. 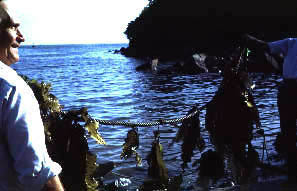 Fragments of adult plants, juvenile plants, sporelings or spores are seeded onto ropes or other substrata and the plants grown to maturity in the sea. 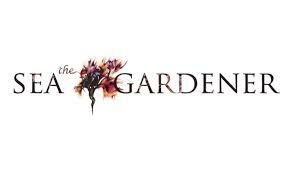 To do this, intimate knowledge of both the biology and life history of the plants is critical. For example, kelps cannot be grown from fragments as there is a high level of specialization and fragments of sporophytes do not regenerate. On the other hand, many red algae do not have this degree of specialization and can easily be grown from portions of the adult plant. Knowledge of the life history is critical in many cases and on-land cultivation of particular life history phases is often necessary for seeding. A considerable amount of technology has gone into the development of reliable methods for the cultivation of seed-stocks and their improvement. The penultimate development in seaweed cultivation is the growing of plants in artificial impoundments on land. This involves the use of either tanks or ponds into which seawater is pumped and the seaweeds are grown detached and at very high densities. This necessitates the careful study of the growth parameters of the seaweeds involved and the development of special strains, preferably with high growth rates, but more importantly, adapted to the artificial conditions. In some instances, the cultivation of seaweeds in association with animals has been attempted, which is often referred to as "polyculture". The ultimate development of seaweed cultivation will probably be the growth of genetically-improved strains in fermenter-like reactors, in which all environmental factors will be computer-controlled and artificially-compounded seawater-like growth media used. It is likely that such strains will be developed by means of biotechnological techniques. Site © M.D. Guiry 2000 - 2019. Important copyright notice: all text, design and photographs on this site are copyrighted by M.D. Guiry unless otherwise stated and all rights are strictly reserved. Click here for copyright information and contact. Website design: 249 Design Studio. Site maintained by M.D. Guiry (michael.guiry@nuigalway.ie). There have been 8724639 page loads since 1 January 2014 on 22 April 2019.